Andreas Fokkens (right) as Rolls-Royce's president of commer- cial marine in June 2002. Morten Ulstein completes his three-year term in charge of the business. Fokkens, who was previously with ABB. 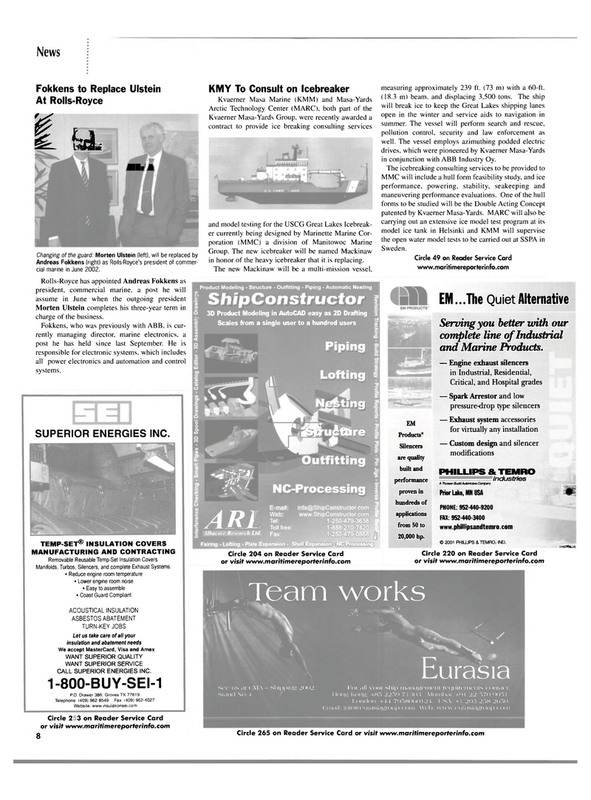 is cur- rently managing director, marine electronics, a post he has held since last September. He is responsible for electronic systems, which includes all power electronics and automation and control systems. Group. The new icebreaker will be named Mackinaw in honor of the heavy icebreaker that it is replacing. The new Mackinaw will be a multi-mission vessel. Scales from a single user to a hundred users measuring approximately 239 ft. (73 m) with a 60-ft. (18.3 m) beam, and displacing 3.500 tons. The ship will break ice to keep the Great Lakes shipping lanes open in the winter and service aids to navigation in summer. The vessel will perform search and rescue, pollution control, security and law enforcement as well. The vessel employs azimuthing podded electric drives, which were pioneered by Kvaerner Masa-Yards in conjunction with ABB Industry Oy. Silencers are quality built and performance proven in hundreds of applications from 50 to 20,000 hp. FAX 952440-3400 www.phillipsandtemro.com © 2001 PHILLIPS & TEMPO, IND. See us j. stand No.4. l;or all your ship management requirements contact: I Ioiij-S Kong: +85 71303. Mumbai: +<>1 22 f".7(> no -, I .